Wondering what do with with the abundance of squash that is all of a sudden overtaking farmer’s markets? 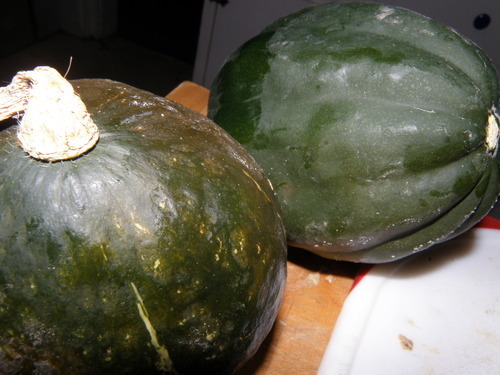 I came up with two delicious and nutritious squash creations (using squash bought at the Ann Arbor Farmer’s Market) this week to share with you all. I got Kabocha squash, but surely you could make these dishes with any type. I first baked the squash in the oven at 400 degrees for about 30 minutes. 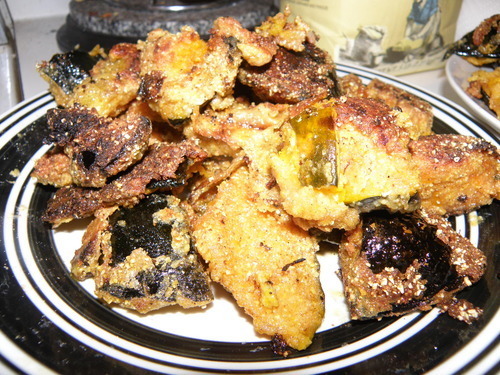 I then cut it in to bite sized pieces, which I dipped into egg, and then coated them in a mixture of whole wheat flour, cornmeal, salt, garlic powder, and cayenne pepper. I then threw them in to a pan of hot olive oil and let them get crispy for a few minutes. The result was a soft, semi-sweet inside with a crusty savory outside layer with a nice spicy kick. Delicious, and a great food to snack on or bring to a potluck! I first sautéed some garlic and red onion (Ann Arbor Farmer’s Market) in a bit of olive oil, and then put in the cauliflower (also from the Ann Arbor Farmer’s Market) and peeled squash (pre-baked to make cutting easier), poured in vegetable broth and tossed in some thyme, sage, bay leaves, paprika, and salt. I let it all simmer together for about 45 minutes until the cauliflower and squash were so soft that they had broken up and the soup was almost creamy (although I never added cream). You could make it even creamier by putting it in a food processor or blender, but I personally like my soup to have a chunkier texture. I made this on a day where I was feeling a little sick and it was the ultimate fall comfort food, full of flavor. Try out these ideas or use them as inspiration for your own squash creations. ‘Tis the season! 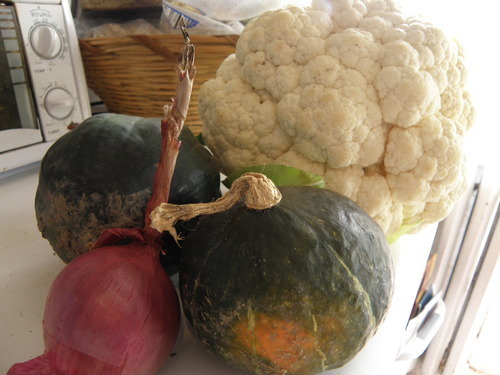 This entry was posted in In the Kitchen (recipes & more) and tagged fall recipes, farmer's market, kabocha squash, lindsay partridge, local food, Real Time Farms, spicy squash fritters, squash and cauliflower soup. Bookmark the permalink.